The MM-6 micropositioner is light weight, accurate, compact device designed to eliminate many research and design problems, especially in the case of space limitations. Hardened steel precision pre-loaded ball bearing slides and high resolution thumbscrew movement assure smooth motion, precision, and excellent load bearing capacity. The black anodized aluminum body is made with a one-piece base and three piece construction. The top plate is designed around an M2 thread size on a 10mm square hole pattern and central M4 tapped hole. The MM-6 is available in single, double, or triple stages. Adding stages is an easy job and requires no special tools. 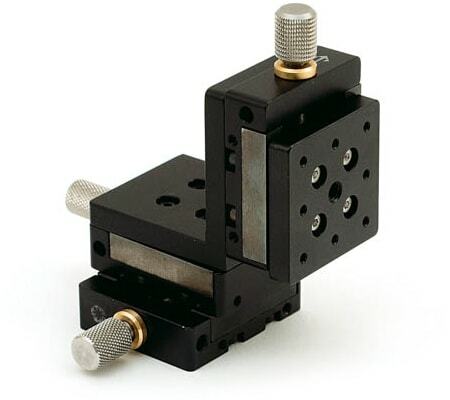 Triple stages come with an angle bracket to attach the Z-axis. The travel of the stage is 0.26in (6.5mm) and the base is easily adapted to most surfaces.